An Energy Weapon, and a specific subtype of Ki Attack or Functional Magic or, occasionally, a gun that fires one or more glowing orbs of Pure Energy/Pure Magic. Most commonly made of light, electricity or fire. Warning: just because it's shaped like a ball doesn't always mean it will bounce off flat surfaces (although if it does, expect it to instantly destroy anything it touches). In fact, they're far more likely to explode on impact, sometimes in an equally spherical blast. You may need special equipment if you want to play tennis. Often created by Sucking-In Lines. 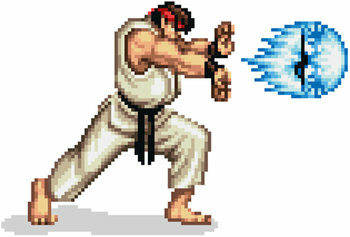 See also Kamehame Hadouken, which may overlap. Supertrope to Fireballs. Compare Sphere of Power, which covers your body instead. In Fullmetal Alchemist, after absorbing God, Father gains the ability to create a miniature sun in his hand using nuclear fusion. A more straight example of this trope occurs around that point in Brotherhood, where he fires some kind of purple energy ball from his forehead instead of creating a tornado as he did in the manga. YuYu Hakusho: Sensui's Reikou-resshuu-ken (single) and Resshuu-shien-dan (multiple) attacks. Dragon Ball: Yamcha's Spirit Ball, Vegeta's Big Bang Attack, Piccolo's scatter shot and most of Broly's attacks, such as his signature Eraser Cannon. Not to mention the Spirit Bomb. Generic balls of energy also get thrown around in pretty much every fight as well. In Mobile Suit Gundam 00, the Seravee Gundam is shown to be able to create a large Energy Ball with its Wave Motion Guns. Koizumi's fireball in The Melancholy of Haruhi Suzumiya, down with Full Metal Panic! Shout Outs. Sgt. Frog: Parodied with Tamama's Jealousy Ball. Vivio's Sankt Kaiser form in Magical Girl Lyrical Nanoha Strikers has the Impact Cannon, a huge energy ball that she punches out of her fist, and the Sacred Cluster, energy balls she throws which would explode around a target and bombard them with smaller energy bullets. Several of the Sailor Senshi's attacks in Sailor Moon, such as Jupiter's Sparkling Wide Pressure and Pluto's Dead Scream. Ku:Nel Sanders of Mahou Sensei Negima! uses giant orbs of gravity magic during his fight with Kaede. Kaede hit back with massive balls of ki. The Choudenji Ball (Super Electromagnetic Ball) from Voltes V, an energy ball launched from the Super Robot's Cool Sword which will simultaneously paralyze the Monster of the Week and weaken their armor, leaving them wide open for the Finishing Move. Naruto's Rasengan. Unique in that it cannot be thrown in its basic form; with heavy refinement - one can create elemental variants which can be thrown with a lot of effort. Tailed Beast Ball, the Rasengan's inspiration. Shin Getter Robo's Stoner Sunshine. Most Ki Attacks in the Ranma ½ manga and video games are actually large spheres of force propelled forward, as opposed to the constant beams shown in the animated versions. Most epic of all: the Perfect Shishihokodan actually does generate a Pillar of Ki straight up... that coalesces into a titanic ball that crushes everything underneath and leaves a perfectly hemispherical crater. Digimon: Kabuterimon's Electro Shocker can qualify as this, as well as Greymon's Nova Blast to an extent. One of Ryoko's abilities in Tenchi Muyo! is to create these. If she squeezes one, it turns into a Laser Blade. Toriko: The Four Heavenly Kings' Dinner of Kings/Ou Shoku Bansan, which is a ball of Appetite Energy that eats everything in its path like a giant Pac-Man. Homura fires a few of these in the first episode of Puella Magi Madoka Magica. Weirdly, this scene is the only time she uses a magical attack instead of conventional guns and bombs. Magic: The Gathering has the iconic Ball Lightning , which is an interesting example in that it's actually a creature, but plays more like a spell. It has both trample and haste, which allows it to hit hard with its 6 power on the turn you play and the damage can't be negated with a chump block. However, it has only one toughness, and even if it survives its attack, it is sacrificed at the start of your next turn. In Burnt by the Sun, the ball lightning ◊ is a recurring Motif. Time Bandits. The mini-fireballs that shoot out of the eyes of the cow-skull-head monsters. On YouTube starting at 5:10 . ThunderFlashes in Septimus Heap are described as energy balls that are used as weapons both by antagonists and protagonists. During the climactic duel between Luke Skywalker and Darth Vader in the Alan Dean Foster's Star Wars Expanded Universe novel Splinter of the Mind's Eye, Vader creates a kinetite, a ball of pure white energy the size of his fist, and sends it at Luke. Luke hits it back at Vader, and Vader's armor is dented inward as if hit by a giant's fist. In Please Don't Tell My Parents I'm a Supervillain, Penny designs a pair of gloves that can generate these for Ray. White Night: Used as a test and demonstration by Harry Dresden. He creates a super-hot, concentrated ball of fire magic and slowly nudges it toward his apprentice, challenging her to stop or deflect it if she can. She'd spent the whole book demanding/begging to help him, and the demonstration is meant to show that she doesn't have nearly enough power or control yet to face off against the things he's up against. In a later book, he uses the same spell to blow up trucks' fuel tanks as a distraction. The ability to fire magical energy from one's hand is a common skill. Even Tiza, who is not a mage, can use it. Eric's first lesson in mercenary magic is how to focus mana in the palms of his hands and eject in the form of a sphere. This is a mana bolt. He later learns various such as the compressed bolt and mana barrage. Charmed. It's part of the standard demon power package: teleport, slow moving dark energy fire-y balls, and... not being able to dodge slow moving light energy fire-y balls. Mighty Morphin' Power Rangers: The Mega Dragonzord's finisher is a giant blue energy sphere with a Z in the middle that completely disintegrates the monsters it's used on. The ever-popular Fireball spell, which flies out as a smaller bead and explodes into a large globe of fire. And Magic Missile, though that depends on the user. Magic Missile can be assigned any visual representation the caster wishes, even as its being cast (at least for spontaneous casters) though it defaults to this trope. Being killed by mini casters glomping you to death has never been so much fun. Also, the Psionic Power "Energy Ball". Not to mention the Epic Level Spell: Hellball. Though perhaps the best examples are the various "Orb of X" spells — Acid, Cold, Electricity, Fire, Force, and Sound — most of which have a "Lesser" version too (only Force doesn't). In Deadlands, this is the basis of the Wichita Witches' trademark spell, Ball o'Doom. GURPS: Magic the Ball of Lightning spell that makes an intangible guided missile that makes an explosion of electricity when it reaches a target. Present in almost every shoot'em up, especially if it's a Bullet Hell genre where every projectile is typically like it. The Hadoken and every other projectile attack that isn't a physical object from Street Fighter, of course. Super Mario Bros.. Unique in that not only does the fireball bounce off the ground, it also obeys gravity. Freaky! Mario's fireballs in the Super Smash Bros.. series behave like this, but Luigi's travel in straight lines regardless of gravity. Doom's BFG 9000 fired one of these. In addition, Imps, Cacodemons, Hell Knights and Barons of Hell are well known for hurling (or spitting, in the Cacodemon's case) fireballs. Mancubi use cannons built into their arms that shoot fireballs that explode like rockets. The Doom 2 mods Brutal Doom and Project Brutality feature the energy balls in the base game and adds new ones as well; The BFG 9k Mark 4 can shoot a single plasma ball or a rapid fire stream of faster but weaker ones, the BFG 11k is a BFG chaingun, Demon Tech Rifle uses "Demon Essence" (the red orbs demons drop when killed) to fire orbs that burn or melt, the Cryogenic Dispersion Rifle shoots globs that freeze monsters, and the Heavy Plasma Rifle shoots plama bolts the scorch monsters to a crisp. New monsters like the Cyber Hell Paladins can defend themselves with their shields and shoot energy balls from the crystal in them and Flesh Wizards harrass Doomguy with fire balls when they aren't teleporting around the battlefield. A good number of Pokémon attacks are represented as balls of whatever element; however, the move entitled Energy Ball is a Grass-type as opposed to being Normal, Electric, or Steel-type. Most likely it's a solar-powered move a la Solarbeam. In addition to the actual Energy Ball attack, there's also Zap Cannon and Electro Ball (Electric-type), Shadow Ball (Ghost-type), and Aura Sphere (Fighting-type). Flash Cannon, which is a Steel-type attack, also looks like a round ball of energy before Generation 6 (where it's a laser instead), even if it's not explicitly in the name. Focus Blast is a Fighting-type chi blast. Gyro Ball is also depicted as one of these, though that's more of the user spinning at high speeds and slamming into the opponent, similar to Rollout and Ice Ball. Strangely, there are no fireballs. It would be pretty useful on Psychic-types who can't learn Flamethrower. Generation V brings us Searing Shot (''Ball of Flame''/''Flame Bomb'' in Japanese) , an attack that can only be learned by one Pokémon, Victini, who happens to be a Fire/Psychic-type. Furthermore, Fusion Flare (Fire-type) and Fusion Bolt (Electric-type), the respective signature moves of the Tao Dragon-type Pokémon Reshiram and Zekrom, resemble powerful fireballs and electrical balls, corresponding with the secondary elemental types of this Dragon duo. If both moves happen to be used in the same turn, the one that occurs second receives a boost, as well. Sunny weather yields the Fire-type. Rain brings forth the Water-type. A hailstorm converts the move to the Ice-type. Sandstorm changes the element of Weather Ball to Rock-type, though Castform itself remains Normal-type and still takes residual Sandstorm damage. Just like Castform, the move remains as a Normal-type if no weather is occurring or if foggy conditions are present. Under the Shadow Sky condition (present in Pokémon Colosseum and XD), this move assumes the ?? ?-type, causing neutral damage against all defending types. Ancient Power is depicted as a silvery-white sphere of energy, but only in the anime. The game animations include throwing levitating stones at the enemy. The move is Rock-type, but the anime might have tried to emphasize that this is also a special attack rather than a physical one (it wasn't shown in the anime until Generation IV, even though the move was introduced in the Generation II games). The Legend of Zelda: Ganon shoots off balls of energy in a few of the boss fights throughout the series; Playing Tennis with the Boss results. Kirby can throw these when using the Fighter ability in some of his later games, in exactly the same fashion as a Hadoken. Mega Man shoots spherical energy pellets of varying size throughout the series. Biotic attacks in Mass Effect 2 appear as basketball-sized semi-spherical missiles of blue and white energy, with slight variations depending on which power you use. In Devil May Cry, Dante can launch fire or light balls at points, while in the first game during his Eleventh Hour Super Power, he launched demonically powered energy balls. Half-Life 2 has the Combine assault rifle, which can generate a ball of energy as its Secondary Fire. These also exist in the Combine's power generators. They vaporize other people instantly, but not you; perhaps the HEV suit grants some sort of protection against vaporization. Portal uses similar energy balls to Half-Life 2 in many puzzles. Portal and HL2 are set in the same universe, and use the same graphic effect and sounds for the balls, but they are referred to as "High Energy Pellets" in Portal. Unlike HL2, if they hit you they will vaporize you instantly, though it may be because of Chell lacking the HEV Suit. Samus' Charge Beam, Mewtwo's Shadow Ball and Lucario's Aura Sphere in Super Smash Bros. Though in Samus' case, both the Power Beam and the Charge Beam are depicted as spherical shots in her series. Pikachu's Thunder Jolt (more evident when used in midair). Final Fantasy XI: Chi Blast, despite people sometimes making Kamehameha macros for it. Marathon has the Zeus Class Fusion Pistol. Halo has several. One of them is the plasma pistol, which can either semiautomatic-fire small ones, or you can charge it up and release a big one at the expense of energy and overheating. The plasma rifle and its various cousins fire energy balls on full-auto. Arcana Heart has a few, such the Sfaira attacks of Partinias, the Arcana of Love, and the projectiles of Anutpada, the Arcana of Time. The Valhawk in Super Robot Wars W can generate this with it's "Plasma Executor" weapon, which also counts as a Chest Blaster. In Dissidia: Final Fantasy, Kuja has several of these floating around him during battle, and uses them for several of his attacks. Elizabeth Greene's One-Winged Angel form in [PROTOTYPE] can fire what are presumably energy balls. Somewhat off considering the mostly organic nature of the series. The King of Fighters: Athena and her Psychic Friends can throw energy balls. Hers and Kensou's don't bounce, but Bao's does, and Athena has the ability to become an energy ball herself, and fire copies of herself at enemies. Several attacks in Baten Kaitos, such as Xelha and Lyude's level II finishing moves. This is the ranged attack that bareknuckles have in Soul Nomad & the World Eaters. Enough attacks in Touhou (a lot of bullets are round), but especially Utsuho Reiuji's attacks (read: miniature stars) and Reimu's Fantasy Orb and Fantasy Seal. Your plasma gun in Purple shoots these. In Tales of Symphonia, Yuan has a lightning orb that he uses this way in cutscenes, and the Sorcerer's Ring allows the onscreen character to fire several different types of them when solving puzzles (depending on what dungeon you're in). Oddly, neither of these examples is ever used in battle. This is the basic magic that all the Reyvateils (singing mages) can use in the Ar tonelico series, and in fact, Misha's even has the same name as the trope. The magick missiles used by the Player Character and the enemy mages in Catacomb Abyss. In the sequels, they're no longer ball-shaped. The shock rifle's alternate fire mode in Unreal Tournament launches a slow-moving plasma ball at the target, which detonates on impact. It can also be detonated by the shock rifle's primary firing mode (an instant beam). The protagonist in Second Sight eventually learns to literally throw balls of psychic energy at enemies, which usually results in instant death and a body being Thrown Across The Room. Later-game elite enemies with psychic shields take two of these to take the shield down, and a third one to finish them off. In Ancient Domains of Mystery, there's an enemy-only attack called "glowing balls" , appearing as * in the ASCII graphics. It appears to be technically a fireball (fire immunity protects against it) but isn't described as such. Most spells that the player casts that have "ball" in the name don't really count because they just create an explosion around the character, which the exception of the improved fireball, which flies to a distance before exploding. Iron Tager's Spark Bolt is a ball of electricity that he shoots out at the opponent - an internal reactor charges the shot for him to use, so you can't toss them willy-nilly. Impact damages and, more importantly, magnetizes the opponent. Makoto's Comet Cannon is another, but she lays it out as a mine first, and can opt to launch it later. It's still damaging as a mine, so one can shut down rushdown tactics in this fashion and crash ice cars as needed. Killer Robot ACE from Gamer 2 shoots balls of electricity. In Legacy of Kain - Blood Omen, the earliest spell that Kain can find is the highly un-vampiric "Energy Bolt", which is a small blue ball of energy. It doesn't use much spirit to cast, but it's a rather feeble attack that you unfortunately have to use for quite a while before the next attack spell is available. In El Goonish Shive, the fire summon spits the fire variation of this during the battle with Justin and Elliot. In The Order of the Stick, Tsukiko the Mystic Theurge learns a number of non-core "orb" spells (Electric Orb, Fire Orb, Lesser Acid Orb, Cold Orb) in order to counter Haley's evasion skill. MatPat of Game Theory tackled the mechanics of Dragon Ball's ki attacks in a Film Theory video , conjecturing that the "energy ball" is actually a plasma the fighters generate with their natural bioelectricity. DSBT InsaniT: Killer can fire green energy blasts. The Darkness counterparts have only one attack: Firing a wave of 5 of these. Dreamscape: Kai commonly uses natural energy like this. The size greatly varies. Shego, Kim Possible's rival, often uses energy attacks in fights, but so far she has only used an actual energy ball once; in Bad Boy, she charged up a giant ball lightning and fired it at Kim. Starfire from Teen Titans fires energy balls called starbolts from her hands. Danny Phantom and the main character's Energy Ecto Rays which at times works in this manner. Aelita from Code Lyoko, since the start of Season 3, gains pink energy balls, called Energy Field, as an attack in Lyoko form. When it hits one of XANA's goons, this covers entirely the monster in energy that destroys it, with no need to Attack Its Weak Point. In Winx Club, this is a common form of attack for any magical character when they aren't shooting one of their Elemental Powers. In the course of history, there have been eyewitness accounts of ball lightning . Laboratory experiments have produced effects that are visually similar to the reports, but the actual phenomenon is still unexplained. Flames on Earth come to a point because the oxygen they use heats up and rises as it burns. If you strike a match in a low-gravity environment where there's technically nowhere to "rise," you get a sphere of hot gases instead.